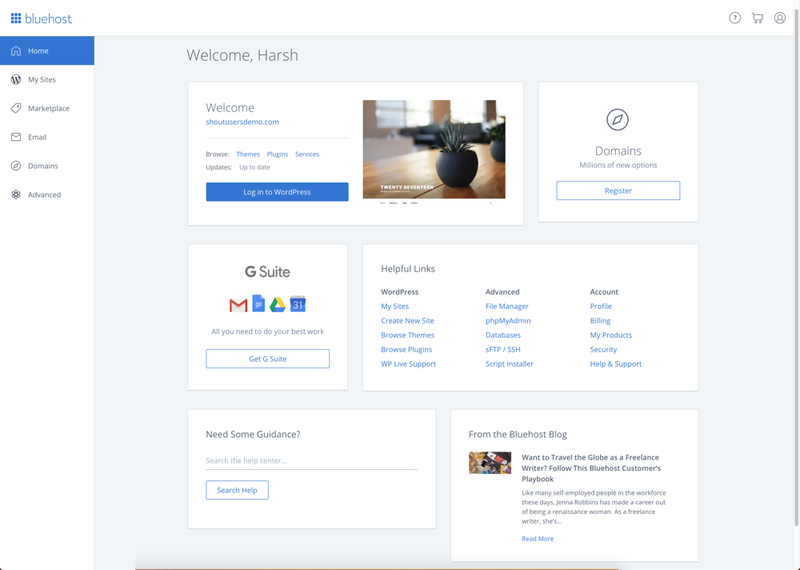 Bluehost has completely revamped it's experience in 2019. They offer in-built caching solution which helps in speeding up WordPress and also offers free SSL certificate. This hosting also has a great reputation in WordPress community & is endorsed by many big names in the industry. There are many Web hosting companies out there, and each one has its pros and cons. I mostly deal with web hosting for WordPress, and when it comes to shared hosting, there are many companies which offer top-notch hosting a WordPress blog. Bluehost is one such hosting company. 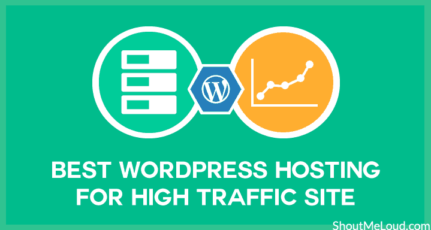 Bluehost has created a name for itself with outstanding server performance & in the past 15 years, they have contributed a lot to WordPress eco-system. 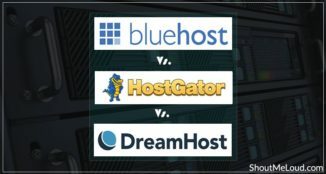 Today I will be sharing a detailed analysis & complete review of Bluehost hosting, and you can decide if this hosting is right for you or not. Support when we face technical issues. Which Bluehost shared hosting package is best? How much does Bluehost cost per month? How much resources Does Bluehost offer? Is Bluehost easy to use? Is Bluehost Customer support good? Bluehost offers various hosting packages including shared hosting, VPS hosting, WordPress managed web-hosting and dedicated hosting. Bluehost’s shared hosting package is perfect for your new blog & it comes in 3 different packages. I will further explain all this below, allowing you to evaluate whether Bluehost is right for your blog. My first interaction with Bluehost occurred in 2009 (and I’m still using it in 2019!) when I migrated my client from BlogSpot to WordPress. Bluehost’s easy installation and nice, simple interface allowed me to install WordPress in less than five minutes! 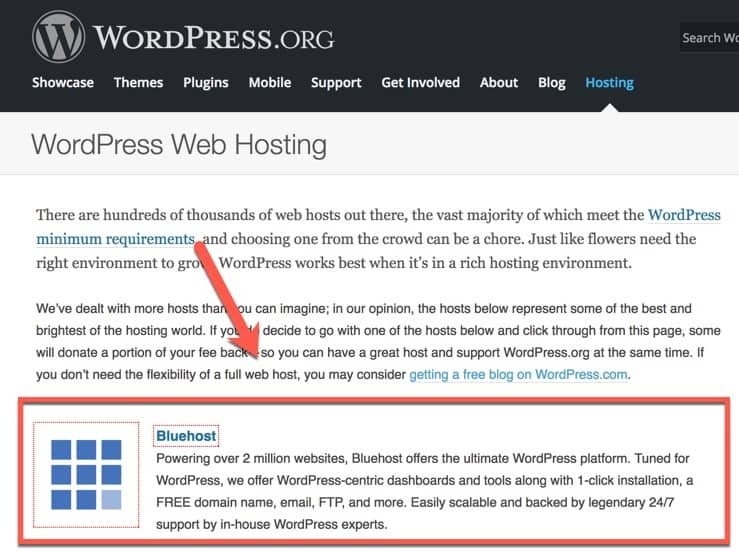 You can read more in this guide on how to install WordPress on Bluehost. The best thing about Bluehost is that their servers are well optimized for a WordPress blog, and this is one of the reasons they are a top recommended hosting service on the official WordPress hosting resource page (see the above screenshot). 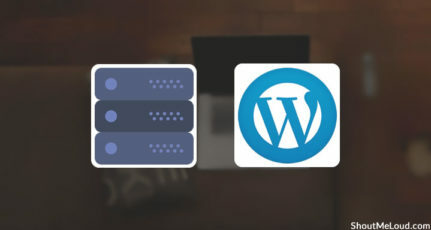 For a reliable WordPress host, apart from running the latest version of PHP and MYSQL, servers should be configured to handle the extra load that typically occurs with WordPress. I can verify that Bluehost handles it all very well. In fact, I have seen Bluehost hosting handling traffic up to 20000/day without any downtime at all. (Using Bluehost In-built caching and Cloudflare to speed up my blog, and recommend the same to you.) Moreover, you don’t have to worry about setting up your caching system. Google is very serious about the security of netizens & this is why they have made an SSL certificate as one of the search engine ranking factor. Bluehost offers free SSL certificate to every new & existing user. This is very important for any blogger who is starting a new site on Bluehost or migrating an existing website to Bluehost. For the new site, Bluehost will automatically install & configure SSL certificate. Here is a tutorial for existing site to use SSL offered by Bluehost. What I really like about them is; a user doesn’t have to be technical to use the SSL (HTTPS version of the site). Everything is straightforward & makes it easier for them to offer a secure version of the site. It’s definitely newbie friendly. Bluehost shared hosting comes in three different packages, and you can choose the one that is right for you according to your unique needs. If you want to create only one website, you should buy the basic package. If you plan to host multiple sites, go with the “plus” package. If your needs who.is guard & site backup pro, you should go for the choice plus package. However, I don’t recommend this package as you can configure the WordPress backup using plugins. My recommendation for most users would be the “plus” package as it offers everything you need and is a complete value for money. (unless you are a business user in need of the dedicated IP and SSL). With the above special link, you can get Bluehost for as low as $2.95 if you pick up the basic package for 3 years term. You will also be getting one free domain, which will help you to save even more money. There are also many free goodies like AdWords credits, which will help you to get the best value for your money. You can pay via PayPal or credit card. For people working from home, Who.is guard is essential for safeguarding your privacy. You don’t want strangers to know your home address and phone number. In this case, grab the prime package for two years or 3. Depending upon the plan you pick, it could cost you from $2.95/month to $4.95/month. Since Bluehost introductory price is applicable only on the first term, you should get hosting for 2-3 years term to make most out of this special pricing. Unfortunately, Bluehost does not offer a monthly payment option. 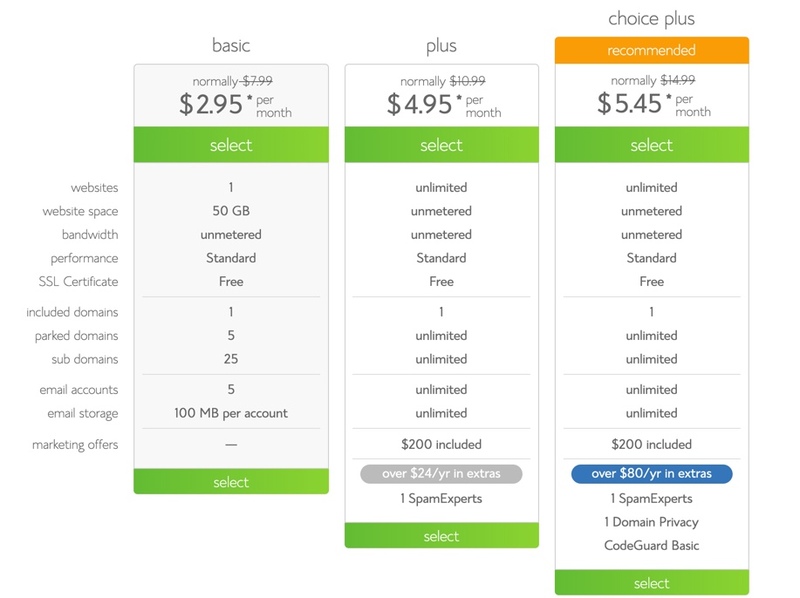 However, here is a few monthly billing hosting. There is one rule of any reliable hosting “Your website should never go down due to hosting issues”. I have heard mix reviews about Bluehost Uptime, fortunately, my experience on a Bluehost shared hosting package has been pleasant. With zero downtime in last 178 days is worth a praise. The credit goes to their recent server architect improvement. Usually, I don’t have high expectations from EIG owned companies, but Bluehost has turned out to be the black swan of EIG owned hosting company. However, you should definitely keep a check on how you are designing your website. Especially a lot of WordPress users end up using too many plugins which eventually lead to the server crash. Bluehost offers unlimited hosting resources. This means that you can host unlimited files, (Disk space) and use unlimited bandwidth. Remember, however, that they have certain fair usage policies (Bluehost limit). But the fair usage policy limit is so high that you will probably find it to be the same as “unlimited”. For example, they allow the MySQL size of 3Gb, and here at ShoutMeLoud, we have only 400 MB of the database after 9 and half years of usage! Unless you are running an auto-script, or auto-blogging, you are very unlikely to reach that limit. 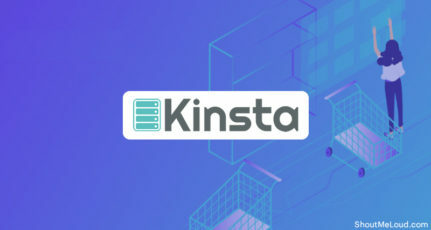 They have a CPU limit, but again that’s high compared to other hosting services, and in most cases, Bluehost will transfer you to a more powerful server if necessary. Bluehost uses cPanel, which is so far one of the easiest hosting panels that I have come across. 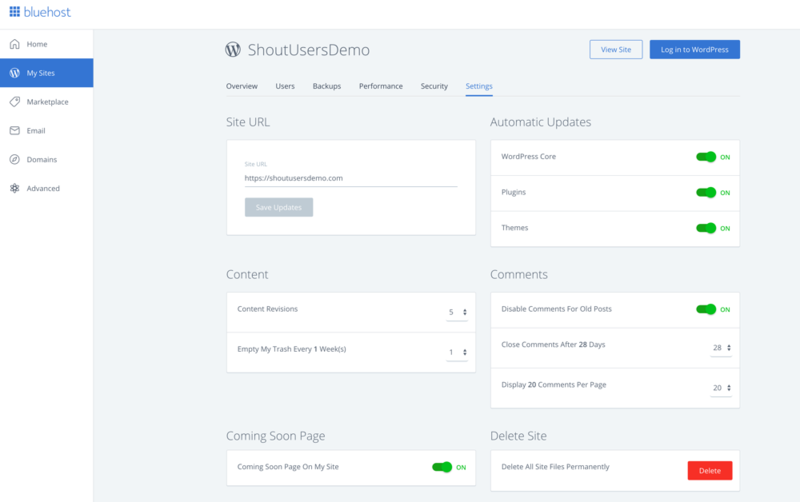 In 2019 they have revamped their dashboard to make it WordPress centric. You can still access cPanel from Bluehost Dashboard, but probably you may never have to use it with newly advanced Bluehost dashboard. Just for info, most of the shared hosting companies use the standard cPanel, and you will not find it hard to use. In fact, cPanel makes managing your hosting account easier. Also, Bluehost is one of very few shared Web hosting companies which will allow you to access SSH. As I heard, BlueHost are going to constantly upgrade their infrastructure for WordPress. It also makes sense as WordPress is now powering over 27% of the websites in the world. Since Bluehost is now WordPress centric, we can expect superior services in coming months. 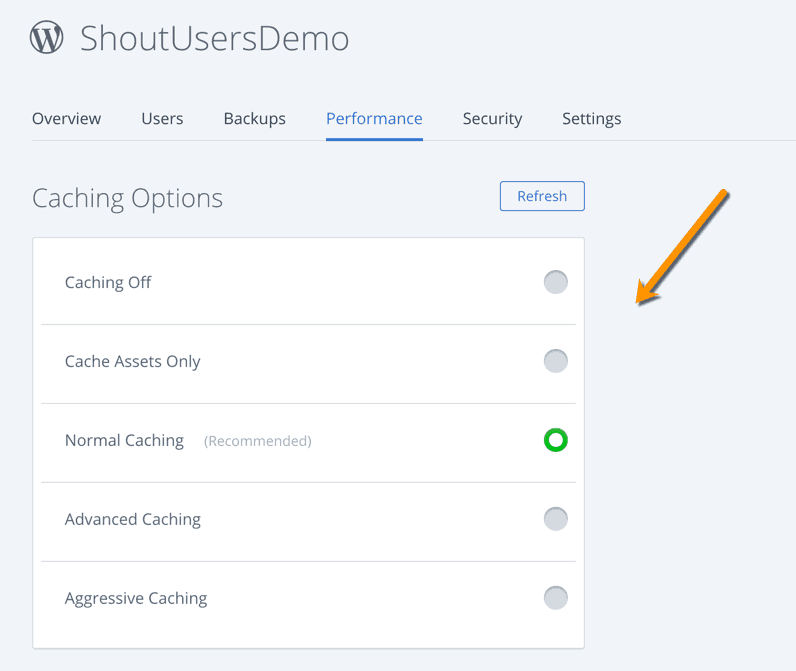 Another cutting-edge feature of Bluehost is the inbuilt caching feature. With Bluehost hosting, you don’t need to use any 3rd party caching plugin like WP Super Cache or W3 Total Cache. Also, depending on the kind of website that you have, you can configure the level of caching. Compared to other hosting services, I would rate Bluehost’s customer support as 4/5. You can get in touch with them via live chat, email or telephone. In most cases, resolution time is 20-45 minutes, which is an average support time for any shared hosting. Since Bluehost servers are optimized for WordPress hosting, you will find that you have very few issues with them. Moreover, they have been in the hosting business for almost 17 years, which is remarkable longevity for any web-hosting company. 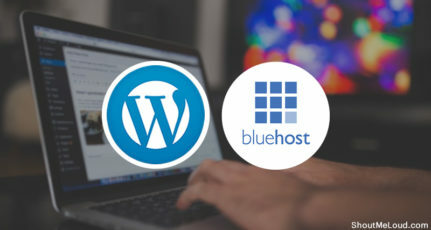 In a nutshell, for a cost of $2.95- $5.95/month, Bluehost is a reliable hosting company that is perfect for hosting a small or mid-sized WordPress blog. You can subscribe to my email newsletter for more reviews and updates. Great review. Bluehost is the best platform for WordPress hosting and a better choice for a starter like me. Does Bluehost provides free website migration service?